A high-powered panel instated by the Indian Ministry of Defense, headed by retired Air Marshal Simhakutty Varthaman, in a new report purportedly recommends that India push ahead with one of the most high-profile joint India-Russia defense programs, the co-development and production of the the Sukhoi/HAL Fifth Generation Fighter Aircraft (FGFA), known in India as the Perspective Multirole Fighter (PMF), according to local media reports. 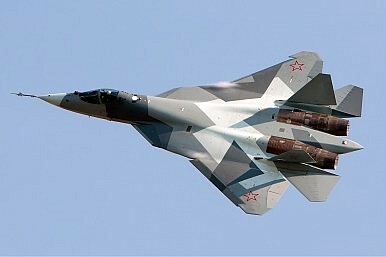 India and Russia began exploring the possibilities of a joint stealth fighter program in 2007. In 2010, both sides signed a $295 million design contract for the co-development of the FGFA/PMF. Yet disagreements over what technologies should to be used for the new aircraft, next to a host of other issues including a work and cost sharing plan, caused repeated delays. “After evaluating the first PAK FA T-50 prototype (the Russian prototype of the PMF), the Indian Air Force (IAF) wanted more than 40 changes addressing, among other things, perceived weaknesses in the plane’s engine, stealth, and weapon-carrying capabilities,” I explained previously. There is still no agreement on how many aircraft should be produced for the Indian Air Force if at all. It is noteworthy that Indian Defense Minister Arun Jaitley and his Russian counterpart Sergei Shoigu, while concluding a military cooperation roadmap in June, failed to resolve the ongoing dispute over the joint FGFA project.